The looooong overdue part 2! Life has been a little crazy, and sadly when life gets crazy blogging falls off the priority list pretty quickly. Never fear, I’m still running and Weight Watching. iFitness Ultimate II Running Belt – Kim E.
Sweetpea Baking Co. Gift Certificate – Cindy E.
Organicville Prize Pack – Emily H.
Ultima Replinisher – Mathilde P.
Ultima Replinisher – Carrie T.
O.N.E. Coconut Water – Sheridan P.
8 X 10 Print from My Zoetrope – Jackie D.
Gardein Prize Pack – Amey M.
Three E-books by Hannah Kaminsky – Alivia P.
Four Annie’s Coupons – Esther O.
Nasoya Prize Pack 1 – Sheridan P.
Nasoya Prize Pack 2 – Kim E.
Nasoya Prize Pack 3 – Alivia P.
Tofurky Coupon (pizza) – Kim E.
Tofurky Coupon (roast) – Brandy B.
Daiya Coupon (wedge) – Miles S.
Daiya Coupon (shreds) – Kim E.
The Team shuttle was scheduled to leave at 5:15AM sharp on race morning. I got up at 4:30 and actually made it to the hotel lobby in time to pick up the provided breakfast and get on board with a few minutes to spare. I’m really, REALLY awful at being on time in the mornings, especially when it’s that early, so I was pretty proud of myself. I may have been driven by the fact that if I missed the shuttle I had no other way of getting to the start line! For breakfast, I had a bagel with peanut butter, OJ and water. I only had a little bit of the OJ to make sure I didn’t get any heartburn. My typical pre-race breakfast is a sprouted grain English muffin with almond butter, so the bagel with pb wasn’t far off. It was probably a bit more caloric than what I’m used to, but we had quite a bit of time until the race started, so I figured it would be fine. 1. Don’t aggravate my IT band. 2. Keep my pace under at or under 12 minutes per mile average, to finish in 2:37:19, which would be a personal best by almost 3 minutes. 3. Negative split the race – keep the pace slow and easy for the first 6 miles and see if I could pick up the pace for the second half. Those were my goals, but if the second two didn’t happen I wasn’t going to be too disappointed, considering training didn’t go as well as I had hoped and I was dealing with the tricksy IT band. At the start of training I had wanted to run the race with no walking breaks, taking gels and liquids while jogging, but I knew I would need to walk once or twice and stretch just a bit to stay healthy. When the sun came out and other runners started gathering, we headed over to the start line for the Team photo. 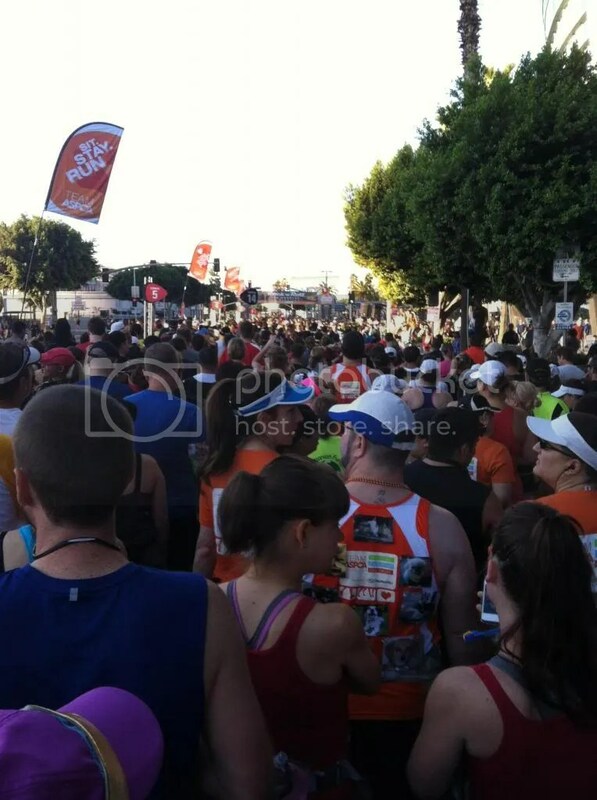 I’m on the right side somewhere in the sea of orange…notice Larry the Dog, Team ASPCA’s mascot, in the middle. He ran the whole race! After the photo we headed to our corrals; most of the Team members were in 13 or 14, and I was in 14. They gave each corral their own start, playing music and counting down from 10 each time. I really enjoyed the energy and excitement, but have to say that I question what the Rock ‘n’ Roll people might classify as rock – I definitely heard Call Me Maybe and other non-rockin’ songs. 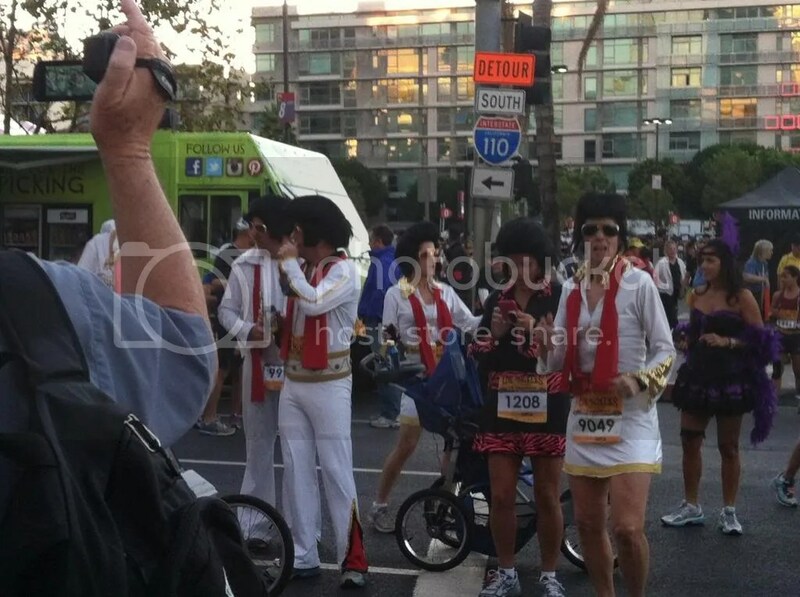 While we waited and slowly inched forward, I checked out some of the costumes, since it was a Halloween-themed race. Soon enough, we were off! This was my first big race with corrals, and it was nice to start with a group who ran about the same pace as me. Everyone started nice and easy, and there was no need to dodge or weave. 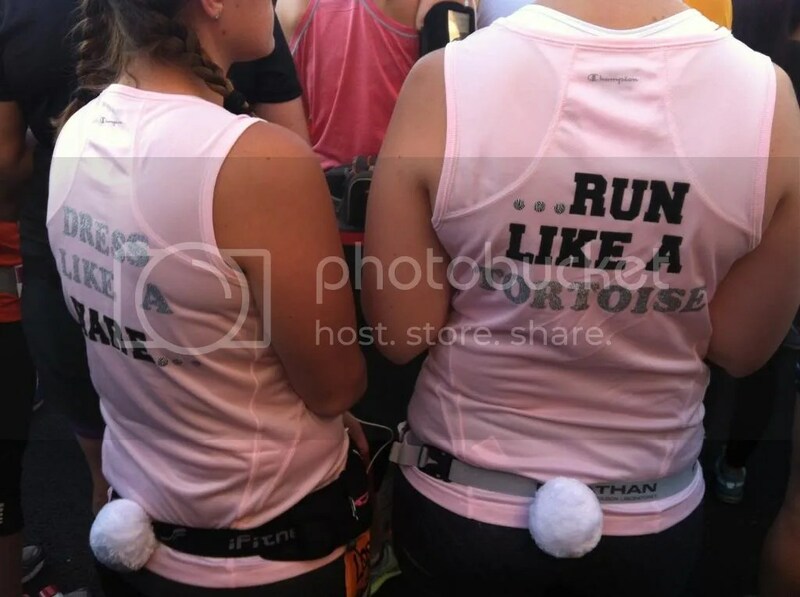 I wanted to hold back my pace during the first four miles, so I just ran easy and enjoyed the bands and the costumes. Two of my favorites were a Rainbow Bright and a Michael Jackson, fully decked out in a red leather jacket, pushing a cart with a boombox playing his music. At the fourth mile marker, I took a quick walk break along with a gel. In addition to carrying Ultima Replenisher electrolyte drink in my belt, I grabbed a sip of water at every station, since it was hot and dry. At the first station with Gatorade I tried a bit, which reminded how gross Gatorade is. From then on I stuck to water. Miles five through eight were fairly uneventful; we passed the start line going the other way (the course was a double out-and-back) and a few more bands. I took another quick walk break at mile 8 but didn’t stop to stretch, as my knee thankfully wasn’t bothering me. Just after mile 9, we started up the only real hill of the course, an overpass. 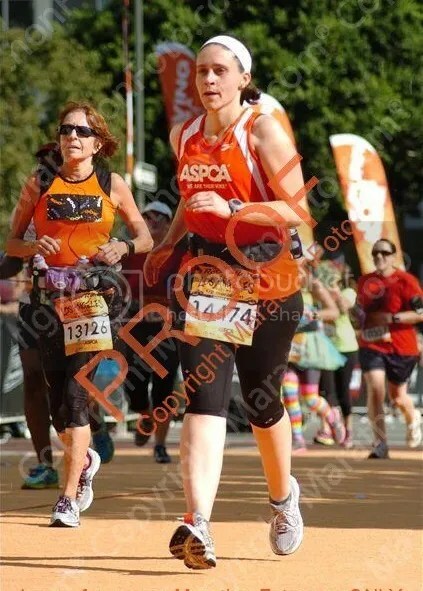 I saw two of the Team ASPCA coaches on the way up, and they both told me that I “looked strong”. I don’t know if that was true or if they were just being nice, but it was good to hear either way! Honestly, the hill wasn’t that bad and I was only a little winded at the top, where we turned around to head back toward the finish. We had a really great view of the downtown LA skyline, which I admired for a minute before I realized we had to run all the way back. Doh! I cruised down the hill we had just run up, and then started to feel how tired I was when it flattened out at the bottom. Toward the end of that ninth mile I was exhausted, and started bargaining with myself as to when I could take another walking break. I went back and forth in my mind about it, and finally told myself that NO, I didn’t need any more walking breaks. I would keep running the rest of the race at whatever pace I could manage, no matter how slow. The shade was nice, and the sun was HOT! I don’t have accurate splits for the end of the race because we went through a tunnel that threw off my GPS, but the last few miles were definitely over 12 minutes per mile. The ball of my left foot was hurting with every step, and at some points I caught myself practically walking. With just over a mile left to go, we made a final turn and could almost see the finish line. 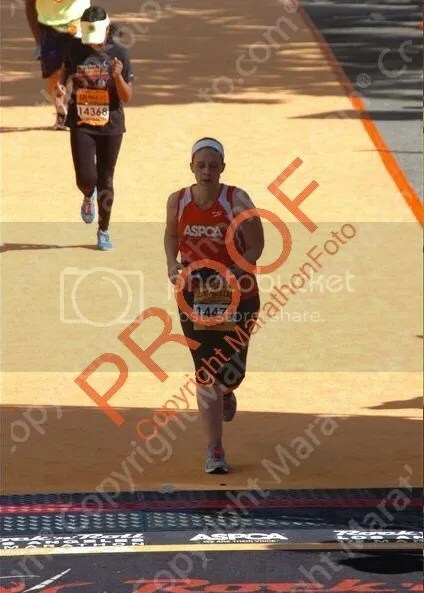 Best picture of me running, ever – both feet off the ground! I had just a little bit of juice left and ran as fast as I could over the finish line. I was really sore and tired, and happy to be done! Jamba Juice had a tent just after the medals and were handing out smoothies, which were confirmed dairy free, and it was SO refreshing. Then a bagel, which I started wolfing down right away, and a slow walk back to the ASPCA area. It was right around the time when the first shuttle was scheduled to depart back to the hotel and I assumed I had missed it until it was announced that they were rounding up to walk to the shuttle right then, so I grabbed my bag and booked it over there as quickly as possible so I could get back and take a much needed shower. I missed out on the main concert and free beer, but showering and food were much more important to me at that point. My official finishing time was 2:39:59, exactly 2 seconds faster than my previous half marathon time. I am nothing if not consistent! I really think I could’ve shaved a bit more time off if the heat hadn’t gotten to me, but I was happy to set at least set a PR. And, while my muscles were quite sore, I was knee pain-free at the end, which meant I had achieved goal #1 of not re-aggravating my IT band. 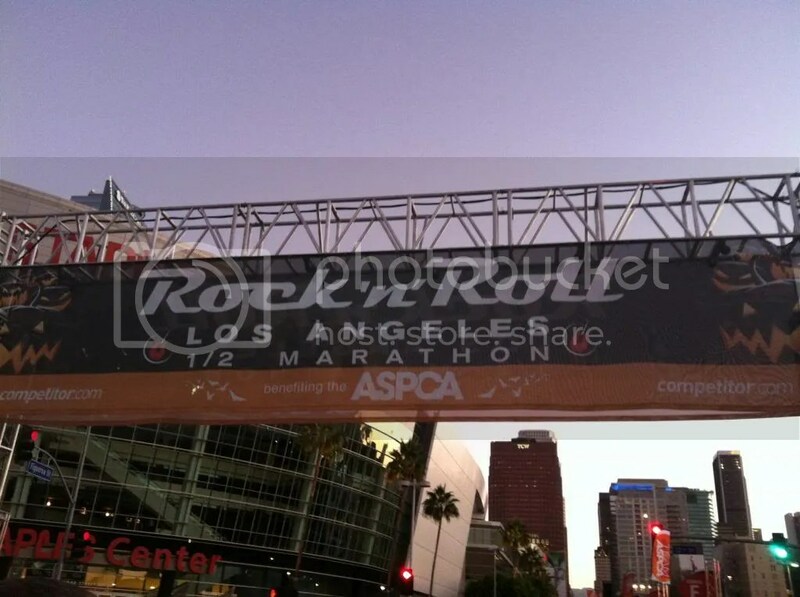 Apart from the heat, I enjoyed the Rock ‘n’ Roll Los Angeles Half Marathon, and would definitely recommend it. The start and finish were well organized with plenty of porta potties and supplies, and it didn’t feel like I was surrounded by so many thousands of other runners. The course was marked well, and the on course entertainment and support were fantastic. I’d like to write a separate post on my experience with Team ASPCA but I don’t think I’ll get to it, so I’ll jot down my thoughts here. 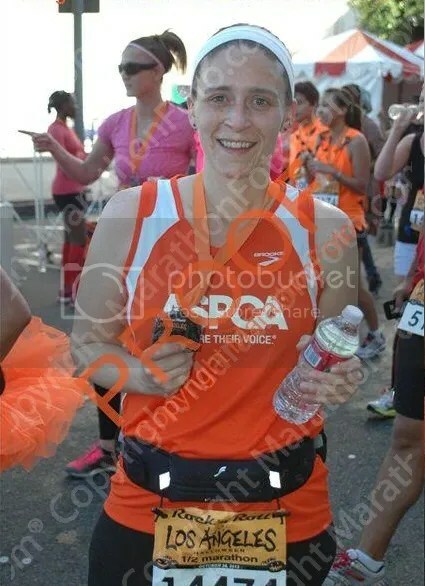 I really enjoyed my Team ASPCA experience, and would recommend it to anyone who wants to train for an endurance event and raise funds to help animals nation-wide. It’s a big commitment, time and energy-wise, and you do have to raise a certain minimum in order to get your race entry and accommodations. Even with all the work I put in and the generous donations of friends and family, I had to cover a bit of the amount myself. I would say that unless you know a TON of people who will donate, you will need to hold at least one event in addition, such as a bake sale or raffle. I wasn’t in an area that had enough team members to train together, which is definitely part of the experience I felt like I missed out on. The support I did have was great though; both the Regional Manager Tina and the National Coach Spencer were swiftly responsive to e-mail, and very helpful. Spencer gave me good motivation and tips when I was training through my IT band issues. Tina is about the bubbliest person I’ve ever met, and she even took me and a few other team members out to dinner one night when she was in the area. 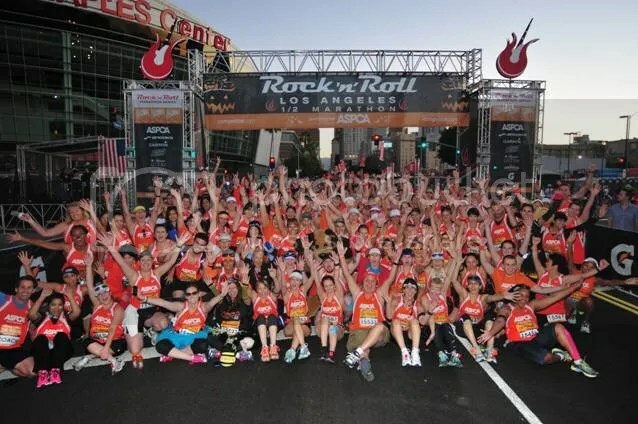 So, if you’re considering joining Team ASPCA for an event, I would say go for it with the understanding that it will take some time and energy! There are a few different training plans available, so it’s good for beginners and experienced runners alike. The race passed (a few weeks ago now), but I still have raffle prizes left, so onward we go! Tonight’s winners are Emily H. and Kylie B., I’ve e-mailed you for prize selection. I have a LOT of pictures from race weekend, so I’m splitting the recap into two parts. This one will be about the pre-race happenings. I left work early Friday and flew down to LAX, and took a shuttle to the team hotel, the Loews Hollywood. I was supposed to be sharing a room with another team member, but there was nobody else there and no one ever showed up with a key, so either I was a lucky odd woman out when it came to room pairings or someone just didn’t show. Either way, I got a sweet hotel room to myself! Score. After settling in, I headed out for an early dinner. 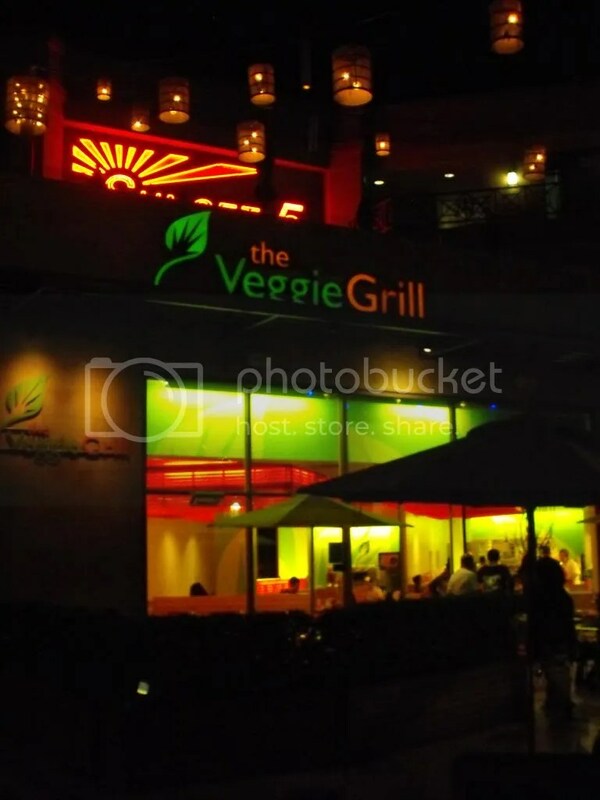 I had researched vegan restaurants in the area, but my top choice was easy – Veggie Grill. I’d never been to one and the menu sounded right up my alley. The closest was just under two miles away, and I decided to walk in order to see a bit more of LA, and to avoid paying cab fare. I was already famished when I set out, and absolutely starving by the time I arrived, so seeing the sign made me incredibly happy. 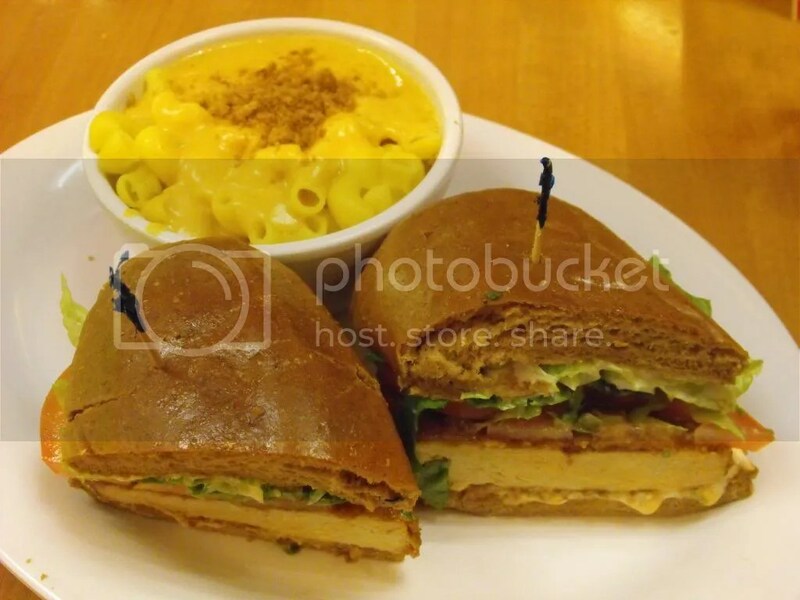 On a normal day, everything on their menu looks great. Being so hungry, everything on the menu looked AMAZING. I didn’t waste any time in ordering, and grabbed a seat. I don’t usually have caloric beverages with dinner, but I took carbo-loading as an excuse to have a tasty drink. 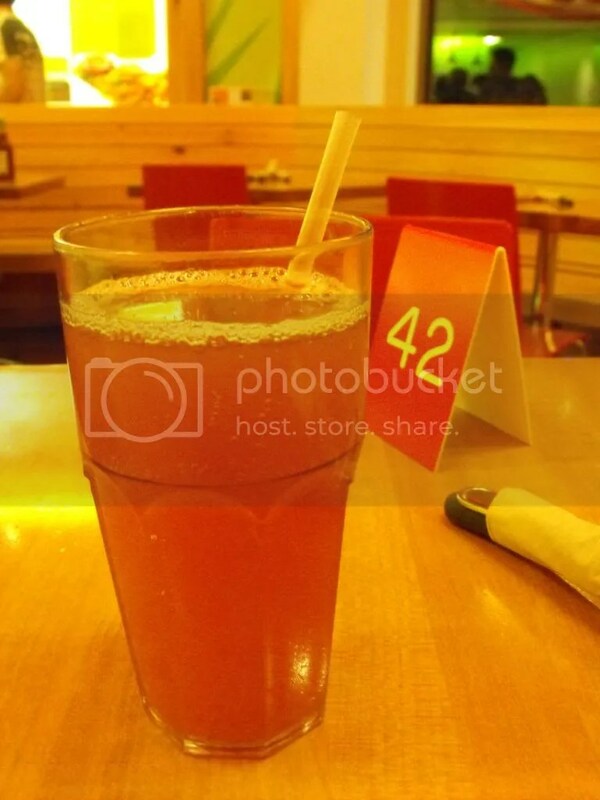 I mixed half strawberry lemonade with half peach tea, which turned out to be a surprisingly delicious combination. While I waited for my meal, I enjoyed watching everyone who came in, including lots of “normal” looking people who you wouldn’t peg for those who would eat a vegan meal. Even the mall security guys came in to grab a take out order! For my meal, I chose the Buffalo Bomber – crispy chickin’ tossed with spicy buffalo sauce, tomato, red onion, lettuce, and ranch dressing. I really loved the sandwich. The roll was hearty enough to hold everything together, the chickin’ was crispy and meaty, and the buffalo sauces and ranch dressing balanced each other well. With carbo-loading as an excuse (again), I went with mac and cheese as my side, and to be honest I didn’t love it. The texture of the sauce was gooey and creamy, but it was a little bland flavor-wise. 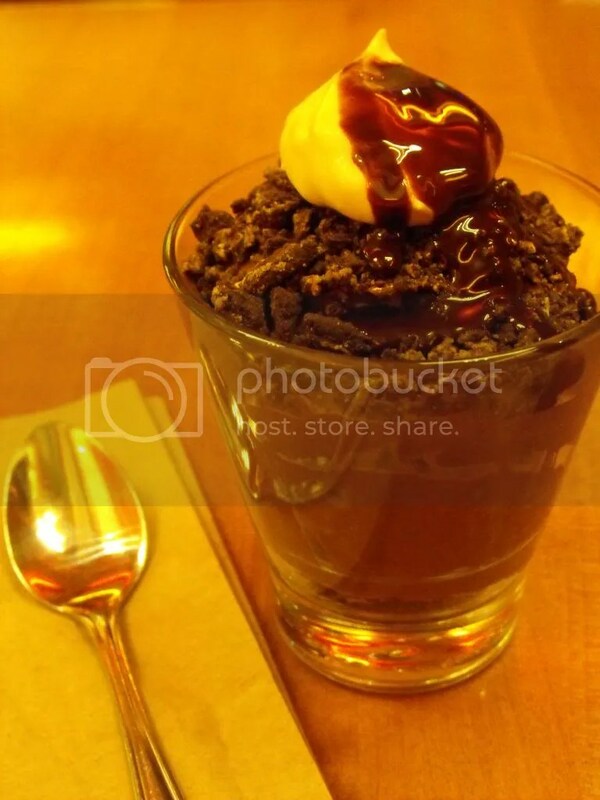 For dessert, I chose the chocolate chia pudding parfait with chocolate cookie crumbles. I was expecting to get something with whole chia seeds, like tapioca, but I was pleased to see this perfectly smooth parfait. It was wonderfully chocolaty and rich, just like the pudding cups of my youth. I took the long way back to the hotel and walked over another hour, which probably wasn’t the best idea two days before a race, but it was a really nice night out and I wanted to explore. The next morning was the coaches’ brunch. I had been told there would at least be something vegan to eat, and I was expecting oatmeal or a bagel and fruit. 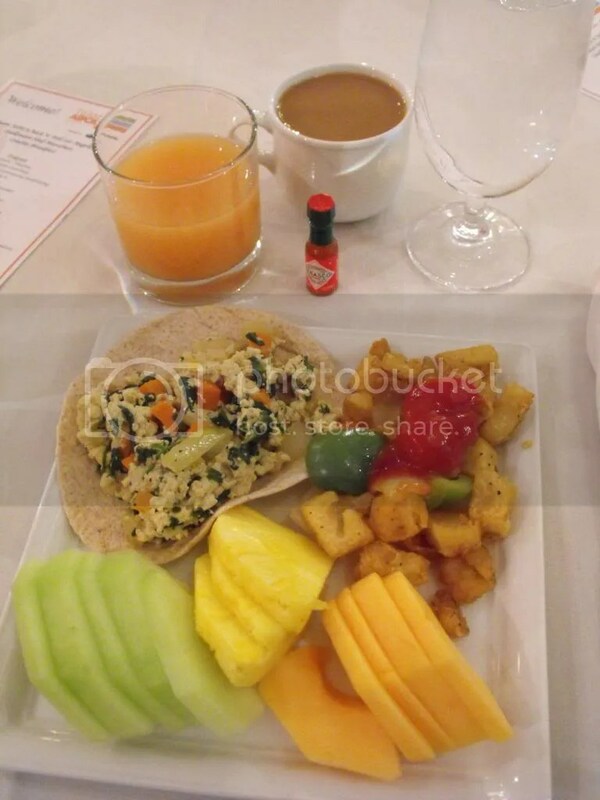 So, you can imagine I was thrilled when I saw tofu scramble (with veggies! ), potatoes (clearly marked vegan! ), and soy milk for the coffee. I was feeling like a bottomless pit that morning, and definitely went back for seconds, only after some potatoes slipped off the plate and spilled ketchup ALL over me and the table cloth. 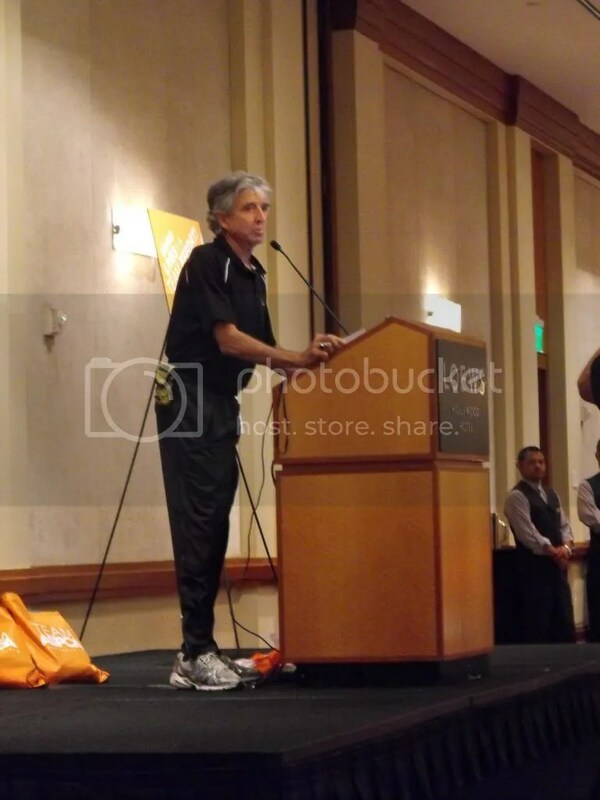 As we ate, we listened to remarks from Olympian Frank Shorter which were great, and then the national coach Spencer gave us some last minute tips and strategies, which were also great. After brunch, we loaded into shuttles to be taken to the expo. 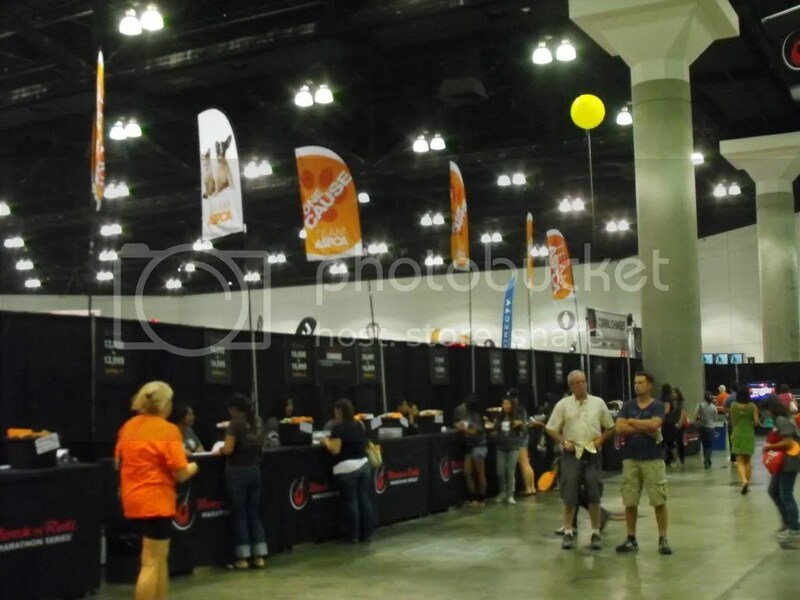 I’d never been to a big race expo, so I was excited to see what it was all about. I was also determined not to spend any money. 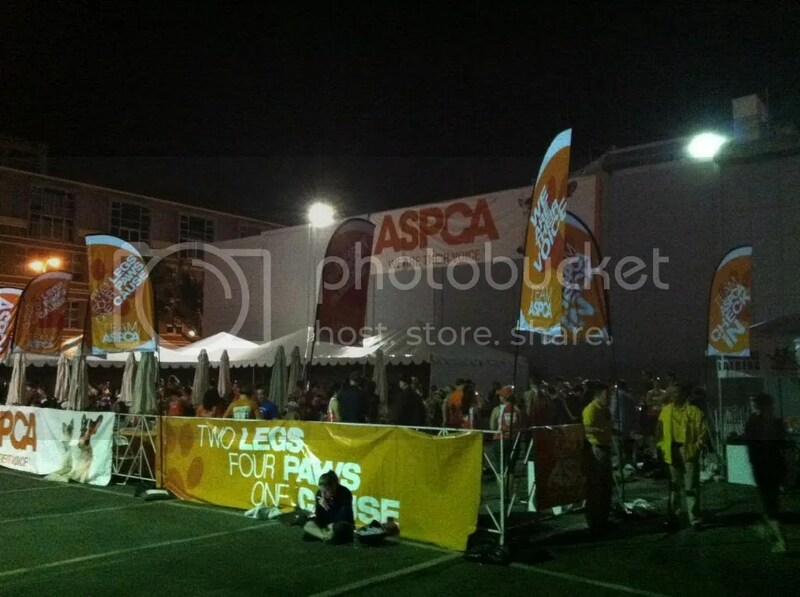 Team ASPCA had our own check in area which was nice, but not necessarily faster since there weren’t a lot of other people checking in at the time. After picking up my bib and swag bag I ambled around for a while, trying some samples and just looking around. There wasn’t a whole lot to do there if you were trying not to shop. The coolest feature, I thought, was a time lapse video of the race course, which gave us a preview of what was to come the next day. 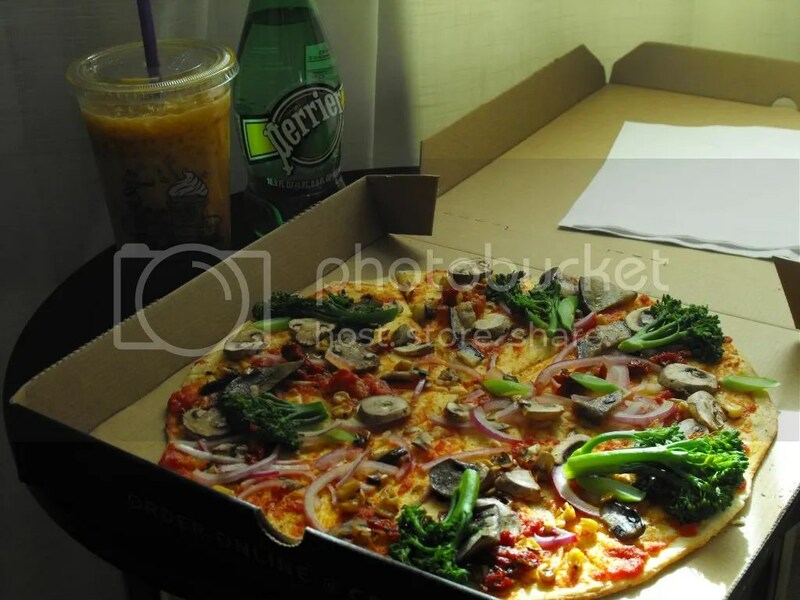 I had plans for an early dinner that night but was hungry already by the time we got back to the hotel in the early afternoon, so I went to the mall next door and picked up a pizza from California Pizza Kitchen. I would’ve liked way more veggies, but beggars can’t be choosers, and this was certainly fine for a get-me-through-to-dinner “snack”. I also had a pumpkin soy latte from The Coffee Bean & Tea Leaf, since I’d heard they’re vegan if you ask to leave out the vanilla flavoring. There was actual chunks of pumpkin puree in it, which was kind of weird texture-wise, but nice to know that it’s made from actual pumpkin. For pre-race dinner, I had plans to get together with Dave’s sister, who lives in LA, and her boyfriend. They’re not vegan or vegetarian, so I tried my best to find a good restaurant in the area that would suit us all, but had a hard time. Luckily for me, they’re really open to different types of food and said they’d be fine with a vegan or vegetarian restaurant, so I came up with a few options. I was really hoping that we’d be able to go to Real Food Daily, but we were a little short on time and traffic was crazy in the area (it was the Saturday before Halloween and partiers were out in full force), so we went for the one that was closest, Paru’s Indian. When we pulled up to the address on Sunset, the front of the small building was a brick wall with bars on the windows. We weren’t certain we were in the right place, but there was an open sign, so we rang the bell and were buzzed through the door, which revealed a courtyard of sorts. We were then lead into the dining area, and it was clear that the restaurant was a converted house, which explained the weird facade. It was really cozy inside, and we immediately became more comfortable with our choice! We started with samosas, which were huge and delicious, and unfortunately I forgot to take a photo. They came with chutney, coconut sauce, and a small dish of some sort of curried chickpeas in brown gravy. 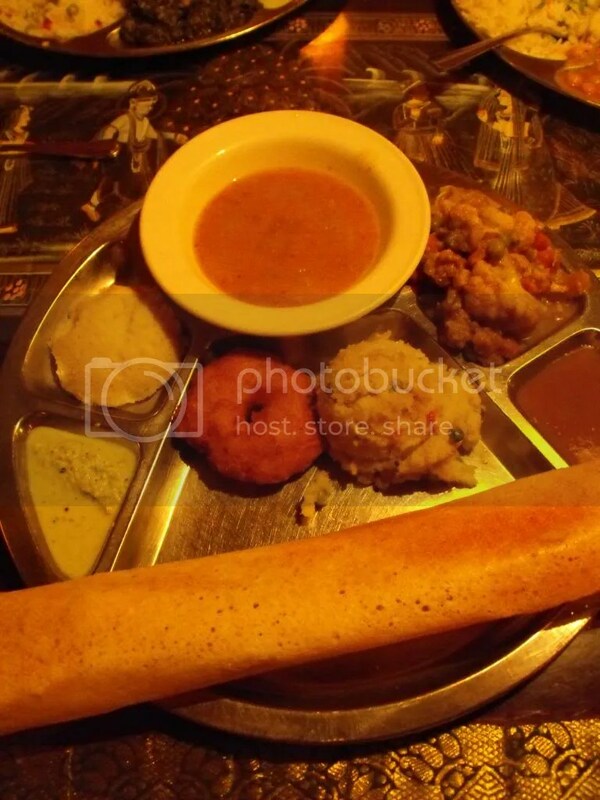 For my entree, I chose the Tanjore Double platter, which was full of South Indian specialties. It was WAY more food than it looks like in this photo! I don’t eat South Indian food very often, and the tastes and textures were so interesting. My favorite new discovery was the uppama, which was described to me as a kind of cream of wheat. And the “mini dosa”? It was at least a foot long. I tried to leave some food on the plate in order not to completely stuff myself, but it was so good that even after I pushed the plate away I kept going back for more bites. I know you’re not supposed to eat anything new or different the night before a race, but honestly I think my digestive system is strong enough to handle almost anything. I did make sure not to order anything too spicy. Next post – race day! Today’s winners are Molly F. and Miles S.! I’ve e-mailed for prize selection. I’m in LA! And the half marathon is tomorrow! I’m currently in my hotel room with my feet up, resting my legs after walking around a little too much yesterday. Week 12 – the last week! Considering how poorly I did with training the two weeks prior, I knew it was really important to stick to the training plan this week. On Monday I ran on the treadmill and had an inkling of knee discomfort during the third mile, so I cut the planned 4 miles down to 3.5. Tuesday’s run was a good one, a confidence building run, clocking in at an average pace of 11:20. On Thursday I knew I should be keeping the pace easy, but the run was short, I felt good, and was in a hurry to get home and pack, and I finished with a speedy pace of 11:15. I’m ready for the race tomorrow, as in I’m ready to get out there and get it done. My training overall, and particularly in the last three weeks, didn’t go as well as planned, so I am a little worried about how well I’ll do. 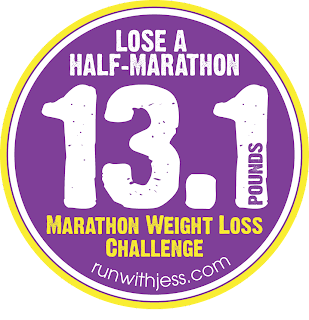 I know I can finish, but I don’t know how quickly or how many walking/stretching breaks I’ll need to take, or what kind of pain I’ll be in at the finish line. 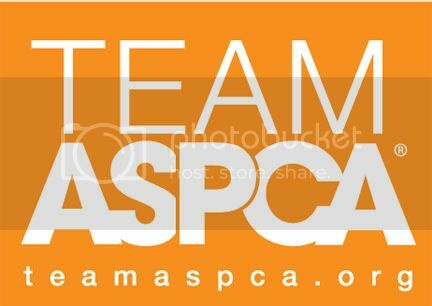 I do think that being around other Team ASPCA members and having the coaches on course, as well as the spectators and bands, will give me plenty of motivation and hopefully keep my mind off any discomfort. 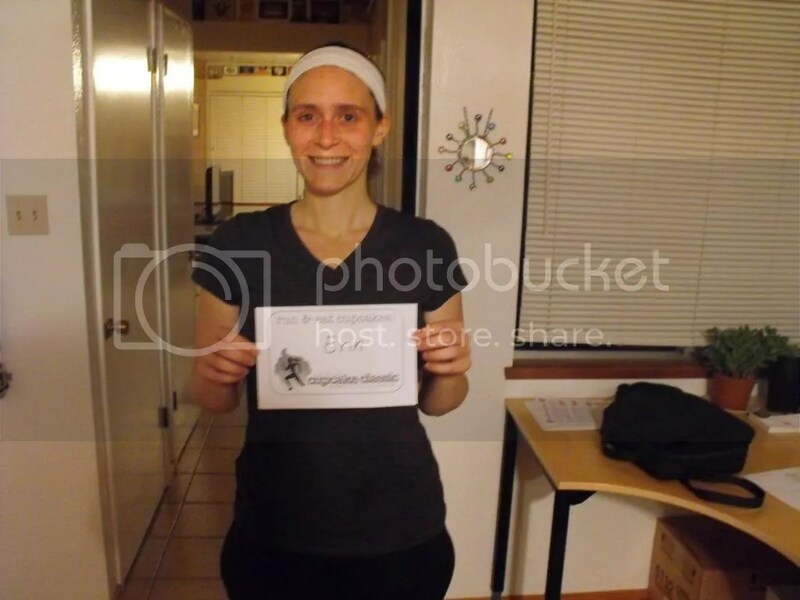 When I signed up for this race, my goal was to step up my training, incorporating speed work, and shave five or more minutes off of my previous time of 2:40. Now, my hope is just to beat that time, even if it’s only by a few seconds. I do feel that I am stronger and faster than I was for my last half marathon, but I just don’t know what to expect from myself considering how sporadic my long runs have been in the second half of training. Either way, I think it will be fun! Wish me luck! This week was the perfect storm of excuses plus events getting in the way of exercise. Monday I was absolutely exhausted after work, and I told myself I could miss the scheduled workout as long as I got up before work and ran the next morning. Of course, that always makes more sense the night before than the morning of when the alarm goes off. At 5AM, unless I have a plane to catch, my brain pretty much always thinks that sleep is more important than everything else and resets the alarm. So, that didn’t happen. Tuesday, Wednesday, and Thursday, the A’s had home playoff games, and we had tickets. It was pretty much work->baseball->sleep for two days, with nothing else in between, and then Thursday I left the game early to catch a red eye to New York for a somewhat last minute work trip. I spent Friday walking around Manhattan and Brooklyn, so at least that was a little exercise. Since I had barely slept though, I was a little bit of a zombie. I planned to run a loop around Central Park Saturday morning before my work event, but since I was still mostly on west coast time I didn’t get to bed as early as hoped, and again needed the extra sleep more than I needed the run, which was sad since it meant I didn’t see Central Park at all. On Sunday I flew to Reno to meet up with Dave and a friend, again in a very much zombie-like state. We drove home Monday, and needless to say I was too exhausted to do anything other than regroup and try to plan for the coming week. That week was a little crazy! I went back to work on Tuesday theoretically rested and ready to get back into my routine, and dedicated to getting a run in, since I had missed over a week. That afternoon though, I started feeling ill – head ache-ey, hot and chilly at the same time, and a little bit of a sore throat. I left work early to rest, and ended up staying home sick Wednesday as well. Thursday I felt mostly better, but the Niners were playing right after work and I thought it wouldn’t hurt to rest one more day to get back to 100% healthy. On Friday, I was finally ready and itching to run! I was scheduled to rest since it was the day before a long run, but I really wanted to get out there and move my legs, and it was also my only chance to participate in the Cupcake Classic Virtual 5K. I had never participated in a virtual race before, and I know the point of this one was kind of to get together with a group, but I decided to head downtown solo. It felt awkward at beginning since it had been a while since I ran. I started to feel better and more natural during the second mile and let my legs go a little, probably too fast. My time for the second mile was 11:04, quite fast for me. I slowed down at the beginning of the third mile to conserve some energy and planned to pick it back up for last half mile, but my leg started to hurt and didn’t want to push it, so I kept it kind of easy until the end. My total time was 35:11, for an average of 11:19 per mile, which is quite good for me! It was a little bit of an affirmation to remember that I can run a 5K whenever I want, even after some time without running. On Saturday I set out for nine miles and vowed to take it easy the whole time no matter how I felt. The first few miles felt sluggish, but I was feeling decent by the third and fourth miles. I started to feel discomfort in my knee around mile 6. Discomfort, I can deal with as long as it’s not too bad. However, in the eighth mile my hip and the ball of my left foot started to hurt, bad enough that it was making me a little nauseated, so I stopped at 8 miles. Tuesday after work we went to the A’s game, and this was about the time when baseball took over my life for a week and a half. The A’s were playing for the AL West division title. They had to sweep the Rangers to do so, and we went to the games Tuesday and Wednesday, and they won (!!! ), but I missed two workouts those days…I finally got in a run on Thursday, but had some IT band discomfort and stopped after three miles. On Saturday, I was committed to finishing 12 miles, and I headed back to the Iron Horse Trail for the second time. I was really determined to finish, and I even took a minute at the beginning to visualize, which is a technique I haven’t really used before. I closed my eyes, breathed deeply, and pictured myself running back to that spot with no knee pain. 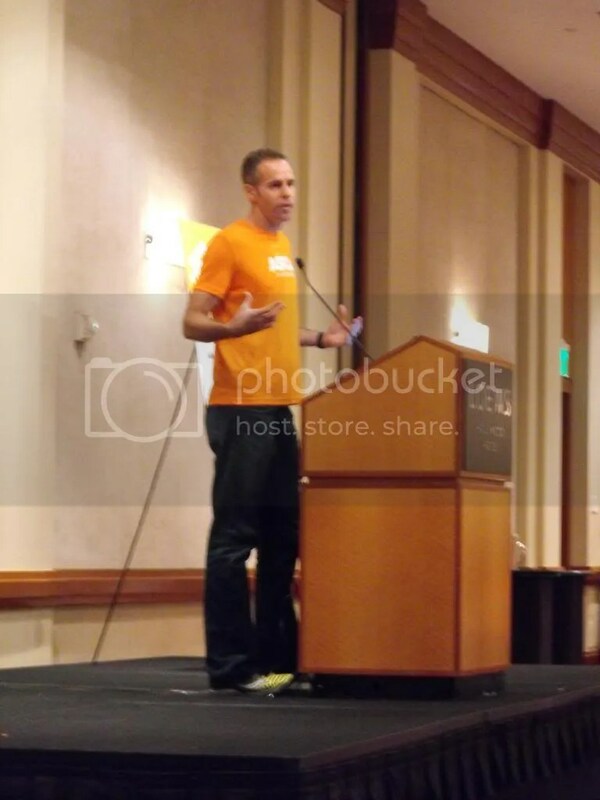 I also committed to keeping mental focus throughout the run and keeping good form. It worked! I felt surprisingly good after 6 miles but told myself to keep going until mile 8 and see how I felt then. Sure enough, by mile 8 I was beginning to fatigue. I took walking breaks at miles 4 and 8, and stretched my IT band and glute as well. The last two miles were really tough and my legs were starting to hurt, but I kept my mental focus, and finished with no knee pain. After having a few weeks that felt not completely successful, it was really good to have a confidence boosting run! I’m hoping to be back soon with an actual post! Today’s raffle winner is Jackie D! Jackie, I’ve e-mailed you for prize selection. When I left off last time I had aggravated my IT band injury during a long run. 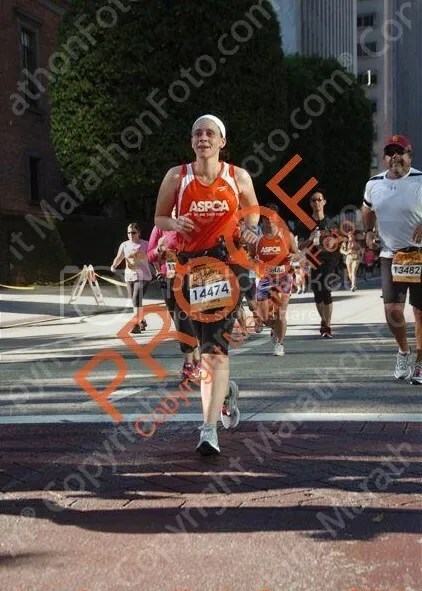 I e-mailed the Team ASPCA coach and asked what he thought, and he advised cross training for a while instead of running, and assured me that I wouldn’t lose fitness by skipping a few runs. So, that’s what I did! I found a yoga for runners video online, I rode a stationary bike and used the elliptical at the gym, and I strength trained. On Friday I went to a running store to see if they had any advice to further prevent recurrence, and upon looking at the shoes I was using they told me they were totally shot, which I’m sure is another reason the injury reared its ugly head. So, I tried a few pairs on since I wasn’t in love with the current ones I was using, and settled on Asics GEL-Evolution 6, which felt lighter and seemed to fit my foot better. I couldn’t really afford new shoes at the time, but had to do what I needed to do to get out on the road. I was becoming one of those people who get cranky when they can’t run! By Saturday I was feeling mostly recovered, so I set out for five miles in my new shoes. I had a little bit of knee discomfort in the fourth mile so I cut it short, but it felt good to be back out there. I got on the treadmill for five miles on Monday, but again cut it short to four due to a little knee discomfort. I really didn’t want to aggravate my injury or prevent it from healing completely! On Tuesday I was scheduled to run my first 800’s ever, but considering I missed 400’s the week before, I did that instead to avoid jumping from 200’s straight to 800’s. I took it easier than usual on the running intervals, but ended up with a good pace overall. On Thursday, I finally added a fourth run into my week, which I had been meaning to do for a few weeks. I meant to take it easy, but really felt like letting my legs go once I got out there, and I probably ran way too fast during the first mile. My average pace was 11:16, which is great for me over four miles. I cautiously set out for 11 miles on Saturday, heading to a new trail that I’d never run, the Iron Horse Trail. It’s a little further of a drive to get there, but I was hoping it would pay off to avoid the gravel that lines the trail I usually use for long runs. My stride felt really tight and off for the first few miles; it felt like I wasn’t fully extending my left leg, or like I was favoring my right side, so I tried to pay attention and even things out. I took walking breaks after four and eight miles, and stopped quickly each time to stretch my IT band and glute, which seemed to help loosen things up. I definitely had some discomfort and didn’t feel great overall, but I finished all 11 miles and wasn’t in pain. The trail was nice, it’s wide and flat and paved the whole way. It’s slightly banked in a lot of places, but I can usually find a flat spot by moving to the middle. There are always lots of runners, cyclists, and dog walkers out which is nice, and the scenery is decent. The trail actually goes right through the middle of a golf course at one point, and there is a chain link fence that curves over the top to keep people from getting hit! Enter your eemail address to subscribe to this blog and receive notifications of new posts by eemail.